When traveling distances without signs of human habitation, you’re wandering in destinations that are becoming increasing rare to experience. A thirteen hour traverse south from Atlanta will put you in such a place. In the dark of night we flew over fertile forests so vast they control much of the world’s climate. To date such mysterious habitats have only been viewed from the comforts of my couch. Tracking the trajectory of the plane, I began to surmise the expansiveness of this rich continent. I vividly recall the graphic animation as the plane entered the northern tip of South America. Hours later it appeared to have barely moved. The sky outside the aircrafts windows were beginning to pale as we prepared to land in Argentina’s capitol, Buenos Aires. 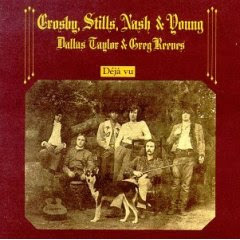 Its size was as impressionable as the country it resides within. After the lengthy journey it was a welcome change, but generally such masses of humanity aren’t much of a welcome reprieve for me, after flying packed like cattle on their way to the slaughter house. Guess I’m not very cultural, preferring landscapes were evening skies aren’t diffused by light or pollutants that are byproducts of the worlds densely populated metropolises. Travel these days has a certain level of anxiety. Add time zones, customs, and language barriers and it’s often escalated to a much higher level. All was going smoothly, until we confronted a check in agent who wouldn’t let us carry our rods on as we began the next leg of our travels after our cultural awakening in BA. She must have been having a ruff day. Our best “Spanglish” didn’t win us any consolations. Somehow, we diverted the discussion sufficiently to move forward, taking fate in our own hands. Had we not, a number of rods would have been splintered into carbon fiber toothpicks, that is if they showed up at all; fortunately only a minor blip, considering other potential mishaps. By the time we met Ron, Chocolate Labs Expedition proprietor and his guides Diego and Eduardo we were ready to see a familiar face. Even in such a remote city as Bariloche, they easily stood out. On a grander scale, in Buenos Aires, street peddlers and merchants of various sensual pleasures annoyingly picked us out just as easily. I’ve found it pays to walk slowly in such situations. Wherever you travel, anglers are easily recognizable by those with similar pursuits, even without rods in their hands. Whether it’s the baseball caps, the ventilated shirts, or the raccoon eyes, regardless there is an aspect of herd mentality that’s noticeable. 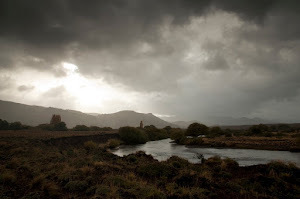 Just outside of Bariloche, we traveled juxtaposed to the Rio Limay. Its invitingly clear currents immediately conjured preconceived images of Argentinean trout. From the main road, we detoured along one of its tributaries, steadily climbing. At the summit, we peered upon the Continental Divide, something none of us expected to encounter. The view was breathtaking, the road fittingly dirt, spiraling down through an uninhabited valley birthing yet another stream. They seemed to be endless. 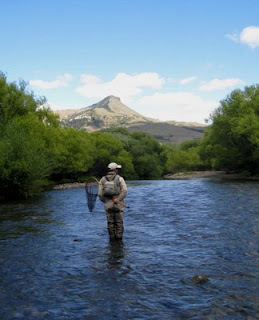 Other than on the Limay we saw no anglers working the pristine waters we crossed that day. Entering San Martin and on into Junin sculptures and signs bearing silhouettes of trout was the first evidence of the areas summer bread lines. Just outside of Junin we crossed the Chimy Huin, another one of the more famous Argentinean waters, yet only one of a vast number we would cross this day. It was apparent that our brief stay would barely touch what Argentina offered in scenic vistas and waters to cast a fly within. 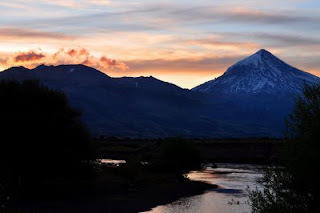 Considering Chile’s snow capped Andes rose just a stones throw to the west where waters of a similar scale and prolificness flowed, a perspective grew that was somewhat inconceivable. At the end of the long drive we entered San Humberto, home to the Rio Malleo, at least 30 some odd miles. The surrounding Lombardi Poplars exposed the properties whereabouts, as they did almost all estancias in the region. Behind its gated fence lay a well manicured lawn, meticulously landscaped with varieties of ornamental vegetation. Long legged Ibis patrolled the grounds for an unsuspecting meal, while the cackle of parrots filled the air. At the end of the driveway, the lodge looked richly inviting. Being late we briefly met the proprietors before being escorted to the first of many epicurean delights and our first of many fine Malbecs. Although it was a snack to tide us until the evening meal, it could have easily sufficed until morning. It was readily apparent the eating in Argentina was an event, at least when it came to lunches and dinner. Dress was hurried as we prepared to sample the waters for the first time. It was what we had come for and anxiously anticipated from the time we left several days past. The Rio Malleo was the perfect beginning to the trip. It’s a small piece of water when compared to many numerous liquid ribbons that dissect this fertile region. Ernest Schwiebert fished here on numerous occasions and wrote of its character often. The stream and the valley it meanders through is as picturesque a trout stream as you’ll find, especially with the towering presence of the Lanin volcano looming in the background. That first evening, those early apprehensions concerning distances traveled eroded as we stepped into the water. 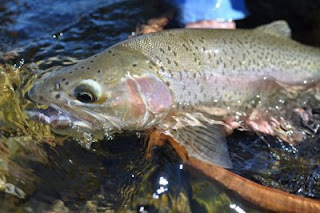 The diversity of flyfishing options in the Neuquen Province is mesmerizing; from tiny spring creeks to waters equaling North America’s “Mother Rivers” presenting infinite opportunities. In our travels we caught many memorable fish, each of us left with our own fond recollections. 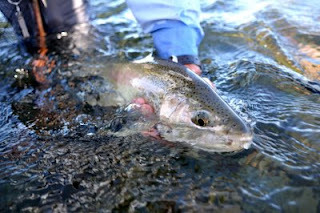 For me, it was one fish that was more a testament to the Argentina’s elements than the fish itself. This last day, winds blew from the put in, picking up where the left off from the previous day. If’ve your familiar with this country from a fishing perspective, you’re privy to it’s infamous winds. This day, they pummeled our backsides. 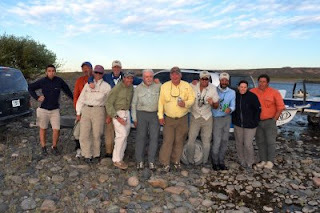 Casting from the boat was tolerable, but they created persistent hardships on all the guides. With growing layers of dense clouds gathering to the west, the winds notched it up in afternoons waning light. The last fish of the day was a plump brown that exceeded most browns encounter when fishing home waters. As Ron tried to set the anchor, the brown propelled itself in the opposite directions of our drift quickly removing the fly line from the old Hardy. As the distance between us lengthened, the wind drove the belly of the exposed line far over the exposed stones of the river bank. In amazement we gawked as the growing tension from the driving wind eventually beached the sizeable brown. By they time we got to it, the fish was almost completely out of the water. At the take out, we gathered. Mate’s, and beers were exchanged while boats and vehicles were loaded for the last time. Randomly one of us would scurry across the rocky shore for articles that the wind had carried off. We paused for a final photo before departing. A certain gratification permeated the group as we assembled, leaning into the wind one last time. 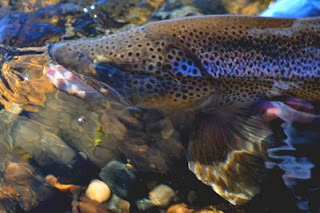 It was a quiet ride back to motel each lost in their own tired reflections of trout, rivers, shared friendships and a time that transpired much too fast. Back on the main road, the sky burned red in the western horizon before giving way to evening’s darkness; that blackness that’s only seen in such corners of the world anymore. Places where one can take stock of life with few if any. We’re fortunate to experience such solace, especially in such distant lands; a luxury none of us take for granted. This morning I was feeling pretty good about the world, all things considered. Then about noon the e-mails began arriving. Rep. Ferry was attempting to resurrect his HB 187 from the depth of yesterdays defeat. Since he heads the House Rules Committee, I was pretty confident that he would be successful with his efforts. There were several of us already at the Capitol when I arrived. Some had been there since the morning session. Just before 4pm after speaking with those we had the opportunity to reach, I looked out across the Capitols floor now growing silent, gazing across the sprawling rotunda cambers when a song from Crosby, Stills, Nash and Young began resonating through my head, “We are helpless, helpless, helpless, helpless…” If you’re in your 50’s, you know the song. At four we scrambled to the balcony to watch Rep. Ferry bring his Bill back to life. Last I looked; he had 40” yas”, plenty to keep HB 187 alive. As the session came to a close, his Bill sits circled to later again be voted upon. 1. Public input into the Bill has been very limited and not all parties have been involved. 2. The list of waters currently included have been arbitrarily derived. We need a reasonable list of waters based upon a specific criteria to quantify waters, not personal opinions. 3. At present, the board is an advisory board only, it has no power. Rumor has it that will change before it goes to its final vote in the House. So pay attention. 4. This Bill impacts 400,000 anglers, anglers that contribute 700 mil to the state’s economy annually. This Bill will erode these revenues and in doing so effect retailers, guide services, restaurants, hotels/motels, make no mistake. This just doesn’t effect anglers and those who derive there livelihoods from angling. .
5. The ability to post private property based upon the 150 yds and 150’ is confusing and will create an enforcement nightmare. When we lost the original clause after the 2nd substitution, we lost the provision that allowed us to wade through such areas. 6. The fact that this Bill has been substituted twice, amended numerous times, and being amended once again shows how flawed it is. We need to take a year, sentd this Bill to interim study and be apart of a piece of legislation that works for those parties that have a vested interest. There is still a lot at stake here and we aren’t out of the woods yet. Rally the troupes. Contact your representative, your senator. There’s only 8 remaining days left to have an impact. Public input into the Bill has been very limited and not all parties have been involved.